Whenever we think of income tax, the first thing that immediately comes into our mind is how to save it !! One of the best options for Saving Income Taxes comes under Section 80C. It is an investment option to save the tax. Government has specially promoted it for long term savings. The maximum limit of Rs 1 lac can be deducted from your income under Section 80C. However, there is a provision for additional Rs 20,000, solely reserved for Infrastructure Bonds. In this way if you are in highest tax bracket of 30% and you have invested upto Rs 1 lac under section 80C then you are saving Rs 30,000. For example if your salary is Rs 16 lacs per annum but you are investing Rs 1 lac in 80C then your taxable income will be Rs 15 lacs only. Even if you invest more than 1 lac in 80C, you can show only 1 lac as investment in 80C . Following investment options are eligible for Section 80C deduction. If your Taxable Income is Rs.700000 and your yearly home loans principal repayment is Rs.40000 and you don’t have any other investments, then your Taxable Income for that financial year is Rs.700000 – Rs.40000 = Rs.660000. If your Taxable Income is Rs.700000 and your yearly home loans principal repayment is Rs.100000, then your Taxable Income is Rs.700000 – Rs.100000 = Rs.600000. If your Taxable Income is Rs.500000 and your yearly home loans principal repayment is Rs.140000, then your Taxable Income is Rs.500000 – Rs.100000 = Rs.400000. Because you can exempt maximum of one lac under this section. So the overall conclusion is the main purpose of 80C is to encourage everybody for long term investment.But there are number of investment options under 80C so we should select the investment options very carefully. Like for younger age person, we should invest more in Market Linked Investment Avenues because by taking risk we can earn much money. On the other hand, for old aged person we should invest more in Fixed Income Investment where there is little risk. To take a home loan is a great commitment and one classic dilemma that all home seekers face is ,whether to opt for Fixed Interest Rate Loans or Floating Interested Rate Home Loans ?? Should you pay more premium in Fixed Interest Rate Home Loans or should we enjoy the changes to interest rate owing to fluctuating market in Floating Home Loans ? Should you ensure peace of your mind by opting for fixed home loans or take a risk by going for Floating Loans ?? These are some of the classic questions, most home-buyers have. This blog-post tries explaining the Pros and Cons for both, Fixed Interest Rate as well as Floating Interest Rate Home Loans. So the first thing is to understand what is a Fixed Home Loans and a Floating Home Loans ?? As the name suggests, we repay the loan amount at fixed interest rate with fixed EMI (Equated Monthly Installment). Interest Rate remains constant during the entire loan-tenure and does not change with market fluctuation. It allows you more freedom and peace-of-mind to plan your financial liabilities accordingly, as you have to pay a fixed EMI, even though market (and hence interest rates) could be fluctuating. Thus it also gives a sense of financial security. The interest rate for Fixed Home Loan is usually 2 % more than the interest rate of Floating Home Loan for same tenure. If the interest rate in market decrease by any chance, Fixed Rate Home Loan borrowers will not get any benefit out of it. It is also called Adjustable Rate Home Loans. In this scheme, the interest rate is dependent on market and fluctuates according to economic situation in the country. If interest rate in market is reduced,you will get immediate benefit of it and you have to repay lesser loan amount than earlier. Floating Rate Home Loan is availed at lower interest rate than Fixed Rate Home Loan. If inter­est rate rises, the bor­rower has two options : The first one is to increase the EMI, keep­ing the tenure constant or to keep the EMI con­stant, thereby increasing the tenure. Irrespective of which option you choose for, you are essentially shelling out more money from your pocket. There is always an element of uncertainty surrounding your loan amount, especially during volatile market scenarios. So financially you run the risk of repaying an amount, more than you may originally have planned for. The first thing that we should keep in mind is, this is not a one time decision whether to go for Fixed Rate Loans or Floating Rate Loans. Most of the banks and financial institutions allow their customers to change it afterwards, if they want to. So if you are having a Fixed Interest Rate Loan, you can switch to Floating Interest Home Loan and vice-versa. But, it is not free and there is a cost associated with the same, So it is always better to take a thoughtful decision at the start i.e, at the time of applying for the loan. Try to compare the interest rate that your Bank/Financial-Institution is offering for Fixed and Floating rate home loans and weigh it against your loan-tenure. If you are going for a long tenure and don’t want to take any risk, then a Fixed Rate Home Loan is recommended. But if you go for short tenures, then you should opt for Floating Rate Home Loans. In the short term, interest rates may not fluctuate much, so paying a 2% (or more) premium for a Fixed Rate Loan is not a very good idea. At present, over 90% of the home loan borrowers opt for Floating Rate Home Loans. As you already know, it is too difficult and involves a lengthy process to enquire about your own PF (Provident Fund) Account. I have already mentioned it at length in one of my earlier blog posts. But, finally some good news for PF account holder. After first announcing it almost 2 years back, EPFO (Employee Provident Fund Organization) has finally said that starting 1st July 2011, PF (Provident Fund) Account related information is just a mouse click away from you, as it will be available online via an SMS to your mobile. PF(Provident Fund) related information will also include the latest transaction regarding your PF account like settlement/transfer-in/transfer-out, your current balance, employer’s contribution etc. However, this facility will be available only for a certain region of the country, at present it is available for Delhi North, Delhi South, Bangalore, Gurgaon, Laxmi Nagar (Delhi), Faridabad and Karnal. Although, they have announced that very soon this service will be available for remaining PF offices as well. For knowing the PF account details, please follow the following set of steps. Select the regional PF office, where your account is maintained. 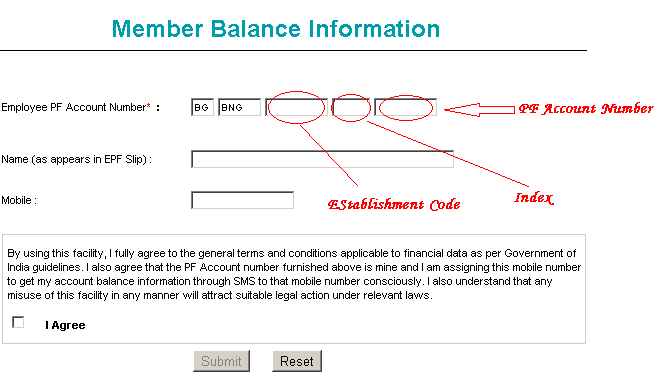 Enter the establishment code (maximum 7 digits), extension field and account number(maximum 7 digits). If there is no extension it can be left blank. Now enter the name and mobile number and submit. Once done, all the relevant information with regards to your PF (Provident Fund) Account will be sent to you by SMS.